The assets you store may include, among other things, sound files. That little detail is important because, in this tutorial, you will learn how to play sound from a sound file that lives inside your Library. Another way is by dragging the sound file and just dropping it on your artboard. Once your sound file is in the Library, you need to make some tweaks to its properties so that you can reference it via code. Right now, while your sound file exists in the Library, it is pretty isolated from the rest of your project. We need to modify its properties so that it can be used. 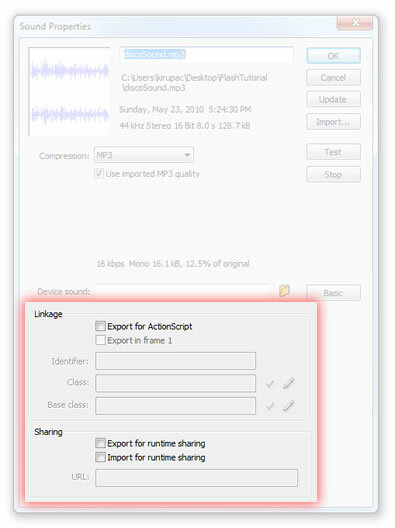 In your Library, right-click on your sound file and, from the menu that appears, select Properties. Clicking the Advanced button exposes properties that you will need to set in order to make your sound file usable via code. 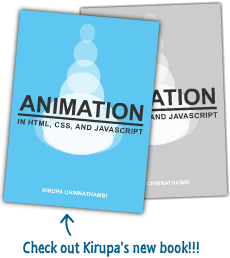 In the Linkage section, check the box marked Export for ActionScript. Once you have given a meaningful name for the Class, go ahead and click OK to accept these changes and to close the Sound Properties dialog. The code is actually very straightforward because all of the logic you would normally need for loading a sound file is not necessary because the sound file is already contained inside your SWF file. In the first line, I am declaring my Sound object called mySound, but notice what I am initializing this object with. Instead of initializing with another object with the type Sound, I am actually initializing an object whose type is DiscoSound. 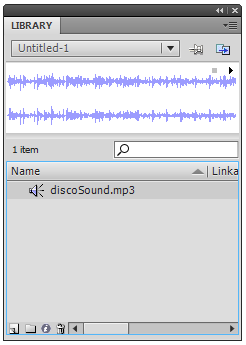 If you remember, DiscoSound was the value I gave our sound file's Class field in the Advanced Properties earlier. By initializing my Sound object as DiscoSound, everything needed to associate the sound file from the Library is taken care of. 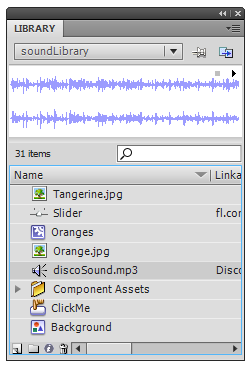 In the second line, when you call mySound.play(), the sound file associated with DiscoSound (in my example) begins to play! That's all there is to playing a sound file that exists in your Library. This approach is nice because you do not have to worry about preloading an external sound file and playing it once it has fully loaded. If you are curious, that approach is described in the Playing Sounds in AS3 tutorial. The downside of using the Library is that it does increase the size of your SWF file, so it is best to reserve the Library for smaller sounds and use the external approach for larger sound clips that can be loaded on-demand.